Came with 4 bits and chisels. Black and white, printed boxes exactlly the same as came with my old Delta. Fence looks real good. Nice design. Fine adjustment knob is a plus. Worked good. Big table base , easy to fasten to work bench. Very stable. Pull out, cast iron table extensions go to about 36 inches. Solid fit. I thought the $289 price was a good deal. Rubber rollers hold the stock next to the fence very well. Will need to buy the Height Attachment. It Raises the height of the mortising head 2 3/8” to accommodate larger work pieces. Looks great Dan. Good luck. I find that the tools do a great job if you set them up right. Lee Jesberger mentioned to me the other day that the back fence was not 90 Deg with the table and the holes were cut crooked into the wood. He blamed Bruce his employee until he checked out the fence. He had to use emory paper and grind off some extra metal to get it to 90 deg. Mine flexes when I clamp a piece of wood up to the fence and I was getting the same condition that Lee had. My rear fence was a seperate piece from the base. I put some coke can shims under the rear of the fence to make it about 87 deg and when I tighten the wood it bends it to 90 deg, I’m looking for some solid steel block that is 90 deg to replace the fence. A great brand, I’m glad you like it. Th unit Karson , mentioned is a Powermatic. Great machine, a bit expensive. But I was disappointed in the fact the cast iron fence was machined out of square. Once that once fixed,the machine is great. Good luck with your unit. The Peggster and I checked the fence with a 3 inch machinest square. No daylight. Fence appears to have a couple 1/2” dia delrun or uhmw buttons. Some manufacturing engineer thought up a clever method to make a square fence. Nice finish on the table top too. Blanchard ground. No visable defects. Looks like a nice casting. Glad your happy with it, Dan. I’m sure you give a mortiser a run for it’s money with the style of your work. Compared to my ole Delta’s, this one is a big, solid upgrade. Dan, I just recently ( about two months ago) purchased the same Steel City model. My first project went extremely well. I really like the whole set up. Dan, you aren’t messing around. I have been looking at these for quite some time. Right now I can’t get past the price tag. One son is starting college and the other already talking about it. Until they are out of school, it is mallet and chisle for me. -- Brian, Lebanon PA, If you aren’t having fun doing it, find something else to do. New to the group and I can say, There is a lot of great information here. I have started my new projects, Now, I am currently looking for a good Hollow bit chisle Drill, I have looked at Steel city , GI, Woodtek and luguna. So much but, I am leaning towards the Steel city. 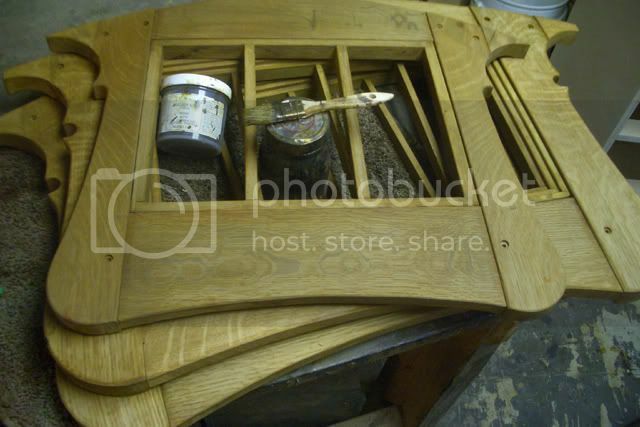 I am building a Cherry Blanket chest to start with and then off to tables and finally a queen bed frame. I will need the drill for Mortise joints and for the Bed project I am using Tiget maple. If you all have any great suggestion as to the drill I would appreciate it and after I finish my first project I will post a photo of the chest. I want to thank you all for your reviews and with time I wil learn more as I go. Great site and learning is a daily quest! Dan, I just picked up one of these “used” and am looking forward to trying it out. I have the mortising attachment for my drill press, boy was that a disappointment, so this should be a huge improvement. Find some sharpe cutters … it make a big difference. I have never found a cutter brand I didn’t like. They all work pretty good. Even the cheap ones. Thanks…. I’ll have to do that.